Chill a cocktail glass. Using a vegetable peeler or channel knife, peel a lemon twist all the way around the lemon until you've peeled half the lemon. The twist should resemble a corkscrew. Twist to expel lemon oil on the glass and rub the rim with the skin side. Put the peel in the glass with a portion draped over the side. Give all ingredients a generous stir over ice and strain into the glass. James Bond came up with this drink while gambling in Casino Royale, Ian Fleming's first James Bond novel (and now a movie). Bond ordered Gordon's gin, but he didn't specify the vodka. Gordon's back then was a 94 proof gin but has since been reformulated to 80 proof. We see Bond drinking Smirnoff vodka often in his Martinis. Though this was mostly a marketing deal in the movies, we know about his predilection for Russian and Polish vodkas in general. So to produce the Vesper Martini as James Bond would have drunk it, you would want to use a good 94 proof English gin such as Beefeater and a good Russian vodka. Instead of Lillet Blanc, which has little resemblance to the the Kina Lillet used in the book and movie, Cocchi Americano is a fine choice. Bond named the drink after his main love interest in Casino Royale, Vesper Lynd. He kept remarking about the flavor of the drink with it's long, luscious lemon peel garnish juxtaposed with Vesper Lynd's beauty. Indeed, the Vesper Martini is quite good, and surprising so given that most drinks "invented" in books and movies are there for reasons of plot, characterization or marketing rather than how they taste. The proportions are three parts gin, one part vodka, and a half part Cocchi Americano. Most recipes will use 3 oz, 1 oz, and 1/2 oz respectively but this results in a rather large drink that doesn't fit into my collection of classic cocktail glasses and coupes. If you have a glass for it, by all means make the larger drink. I prefer the amounts given in the recipe as it fits in my 5 oz cocktail coupes nicely and still packs a more than double standard drink punch. You will most often see shaking specified and Bond would no doubt prefer it that way. 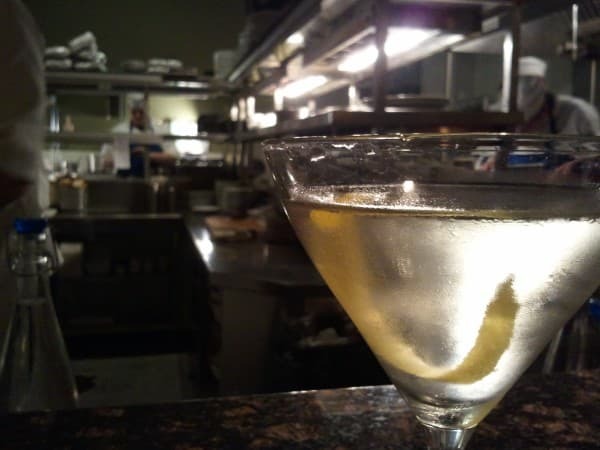 I prefer a Vesper Martini stirred so as not to aerate and cloud the spirits too much. I do stir a little longer than normal to get adequate dilution as this is a strong drink swimming with high proof base spirits. So do you make the larger drink? Shaken or stirred? Please let us know in the comments below.